Balikbayans (literally “balik” means return; “bayan” means country) and foreign guests should share the same list. After all, who better to promote the Philippines abroad other than our very own “kababayans” (fellow countrymen). The balikbayans or returning/holidaying countrymen have conjured up images of local foods they must try/taste long before their arrival. You see, food images can either excite you or leave you in despair. 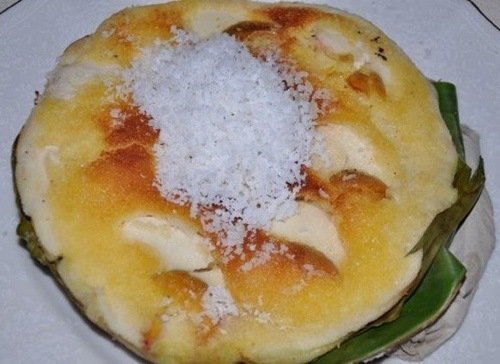 Rice Cakes with Dessicated Coconut, locally called “bibingka”. I always bring my guests to Via Mare for their bibingka and puto bumbong fix. We are rice eaters like many others in Asia. So it comes as no surprise to find the equivalent of suman, puto and kutsinta in other parts of Asia. But i found none similar to our bibingka and puto bumbong. If there are, I have not seen nor tried them. So, how about introducing these rice-based eats to our guests? 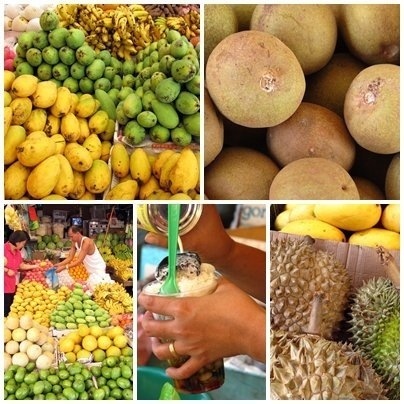 Mangoes — green and ripe, Chico, Durian, and other local fruits. Remember how we drool just thinking of cherries, persimmons, dragon fruits, naranjas, grapes, etc? Carnivores and vegans alike would most certainly be interested in our local fruits. No “eww factor” and it won’t cost you big time! And how about sweetened and candied fruits? I can think of our dried mangoes, condol and pineapples. 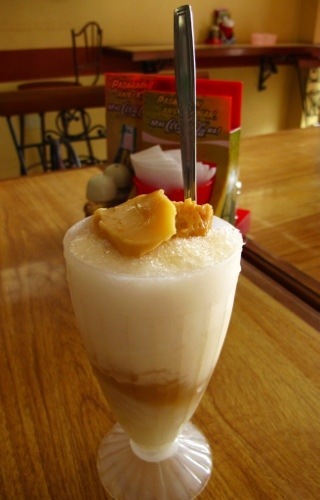 Halo Halo is not exclusive to the Philippines. Fruits with ice shavings can likewise be found in Japan, Vietnam, and elsewhere. But ours is unique because of its toppings. 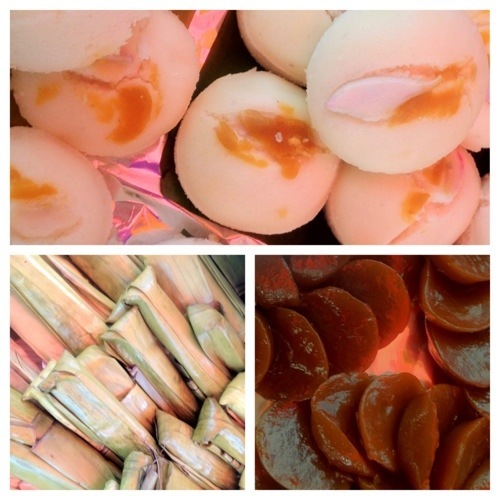 Halo-Halo combines many of our sweetened fruits along with the very local yam (Ube) and Leche flan. Now, wouldn’t these choices be lots better than the “balut”? (By the way, they also have “balut” in Cambodia but locals there would not have it at the top of the list of must-try dishes.) Halo Halo sells for as low as 20 pesos (San Andres Market), maybe lower in the provinces. A humongous serving can be had in Manila Peninsula, but it will cost you. Me? I’m quite happy with Digman’s halo halo or the finer ice shavings and simpler (aka fewer but yummy ingredients) halo halo from Razon’s. 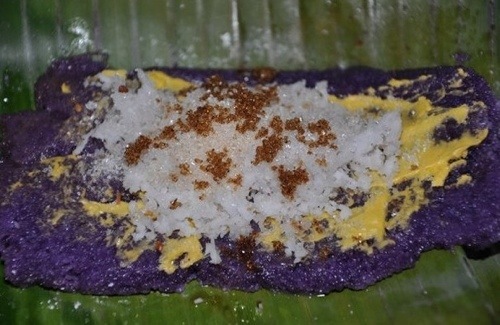 Many local eateries also offer this as “merienda” (snacks) or as dessert. Noodles. Italian pasta, Chinese Pancit, Korean Chap Chae, Japanese soba. All noodles. What have we got that’s different from the rest? 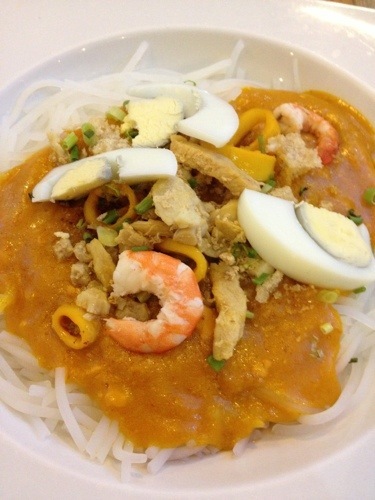 Palabok or Luglug, or even Pancit Malabon. The sauce base is different. Color is different. Toppings are different, especially if you load up with crushed chicharon. And don’t you just love how the sliced, boiled eggs sitting side by side with the squids, oysters and squid rings take center stage?